The inspiration for CASEE came from a science teacher and an agriculture teacher asking why are we teaching these subjects separately. 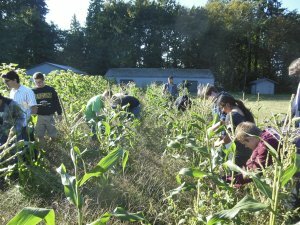 The concept has expanded to integrating physics and engineering curriculum and the current pairing of microbiology and biotechnology but CASEE’s roots will always be in agriculture. The campus includes a large two acre garden where students grow a variety of heirloom and modern vegetables. There is a smaller garden near the greenhouse for temporary storage of bare root plants and experimental plots. Our partners the Naturescapers maintain several ornamental gardens designed to be both beautiful and beneficial to wildlife.